NOTE: Ringplus is no longer offering service as of 2/11/2017. As such, this post is left as just an FYI. 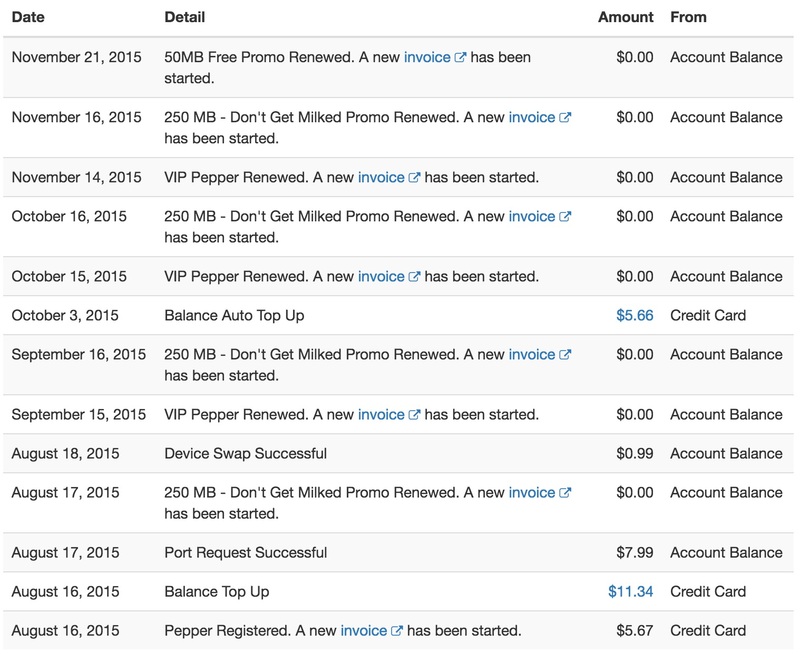 I have since moved on to FreedomPop mainly for my daily data use. You may find this post helpful. 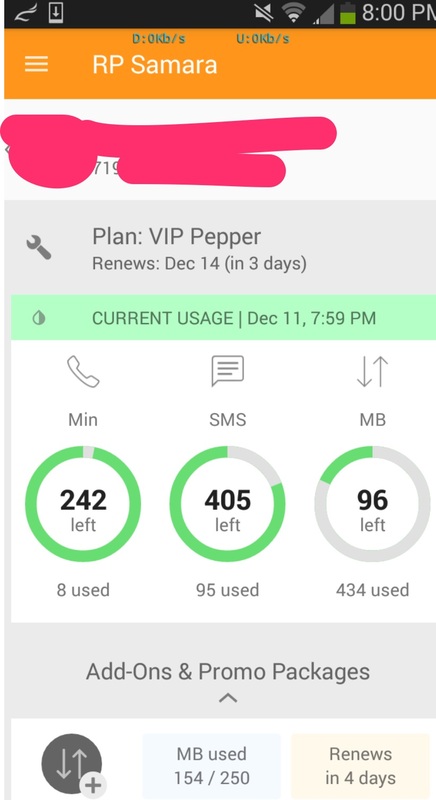 Reducing mobile plan monthly fees have been one of my long term goals. I “think” I have found how to get free mobile phone plans today! Let me show how I reduced my mobile phone plans to near zero costs today. This is Ringplus review and its BYOD program. Disclaimer: As of 11/15/2016, I am aware Ringplus has plans to discontinue most free plans. I am also affected. As such, please do your own research for getting an appropriate Ringplus plan if you decide to go with Ringplus. Here’s my monthly fee invoice for my current phone. I will let you decide whether to read on or if this is worth your time reading!! I basically paid $22.67 in the last 4 months. I spent $8.98, and I still have $3.94 left in my account. The difference of about $10 is something I had to spend because I had some unintentional overages that I caught. So in total, I have spend something like $18.73 in the last nearly 4 months. That’s less than $5.00 a month. BUT notice there has been NO charges for the last two months once I got to fully understand how it worked with overages. This will most likely continue as long as I don’t mess up. Here’s the invoice for my second phone. It has the initial top up of $5.66 ($5 plus rather high tax) I paid, and I still do have the $5.00 balance in my acct, making this truly free for the last 3 months!! For my main phone, this is the plan I have. As you see, I have 250 min./500 Texts/580 MB, which is not too bad for a free mobile phone service. Oh, I don’t usually talk on the phone that much, so 250 min is good enough for me. I do use quite a bit of data, though, and fair amount of texts. For my second phone, which I mostly use for data, I have 1000 min./1000 Texts/1.03GB. This is even better for a free mobile phone service!! These top-ups I paid do stay in my account, so these are NOT monthly recurring, and they are used only for overages which also as good rates. This is rather unbelievable, isn’t it?? Are you interested in at least trying it out?? Just to be clear, I don’t get any commissions from Ringplus. As such, I will tell you all the details I have noticed, and why I have still stayed with them after a few months of “trying” it out. My story goes like this. I used to be a T-mobile customer and moved to AT&T (both were in contracts at the time) long time ago. I used to pay over $60/month for one phone with AT&T, and I really didn’t like paying that much. I had an iPhone 3 at that time, and the network speed was slower. I even did NOT talk that much. $60+/month was just way too much I thought. When the 2 yr contract with AT&T was about to expire, I looked for other options. Virgin Mobile was the best at that time for my use with $35/month. And I didn’t have much choice for unlimited data (2GB full + reduced data after). I sincerely thought this was a life saver for a while!! Virgin Mobile is a MVNO, Mobile Virtual Network Operator, and it uses Sprint’s network. I don’t want to get in to any discussions about whether Sprint is good or bad or any other provider you currently use is good or bad. Everybody has preferences and all I would say is that these competitions and various choices are good for us as end users. In the area I currently live in, Sprint’s network is good enough. I think AT&T and Verizon are also good. I am not really fond of T-mobile in this particular area because I get very poor reception at home. While on the Interstate, T-mobile does start picking up good signals and when it does, it’s great. Therefore, each provider has pros and cons. We all know those. Ringplus is a relatively new comer in the mobile phone business, and it’s also a Sprint MVNO. So if I use this service, I would get almost exactly the same coverage which has proved to be true in my last few months of usage. The good news is that Ringplus currently offers free mobile phone plans with some top-off amount which almost acts a deposit that stays in your acct to pay for any overages. You may have heard of Freedompop mobile phone service. They also advertise free service and as long as you know small details, yes, it can be free forever as long as your phone doesn’t break. I do have a Freedompop phone, and I get 500 min./500 texts/1GB data. This service is pretty good as long as you only use data, but their voice/texts also go through the same data connection (or Voice over IP). Unfortunately, voice usually didn’t work well for me, so I only use Freedompop for data. Ringplus’ voice and texts go through the local voice tower, and I like it very much. Ringplus works all the time for me, not like Freedompop. For Ringplus data, I do get 4GLTE almost all the locations I usually go. The speed is pretty fast, and YouTube videos can play without any issues. BYOD is “Bring Your Own Device”. There are a few Sprint MVNOs available that offer very similar BYOD service. The phones you can use with Ringplus are Sprint Prepaid Phone, Virgin Mobile Phone and Boost Mobile phones. Most of these phones are supported. If you are or used to be a Sprint customer, you may have your old Sprint phone somewhere in the house. If you do, lucky you! You may want to try it. Go to this BYOD page, scroll down to this section, enter your IMEI number, and submit. If it says, it is compatible with Ringplus. You can activate it for free. This free activation is also a pretty good deal since Freedompop charges something like $20 to activate. Below is the current available plans. There are also paid plans, but I am rather only interested in the free plans. You can take a look at the URL above. Free monthly price with various plans. Very reasonable overages amount. For instance, 1 additional minute, 1 additional text or 1MB of additional data AFTER overage costs 2 cents. I do like the overage prices very much because it’s pretty easy to go above data usage unless you pay some attentions to. But if you do, you are somewhat covered to keep the costs to minimum. One notable thing to notice is that Ringplus people do listen to their customers. They frequently listen to our ideas and they incorporate them. The good thing is that it seems always a better plan comes out frequently. Once first phone was added to the service 4 months ago, and the service plan was somewhat inferior to the second phone you saw above. Most ideas are discussed at their forum site here. This forum site is very active. Take a look at this article and see how much others charge on overages. You will notice data overages for 2 cents/MB is CHEAP! You can use RP Samara mobile App to keep track of usage. I think this is also pretty cool. This one is particularly helpful since it tells you what’s left. If you don’t have a BYOD, but still would like to try Ringplus, you can go to their store and buy their phone. If you have any Sprint compatible phones, I would say you try it. You will be pleasantly surprised if it works without paying anything. It can be a good second phone in case your first one needs to be in maintenance or something. If you want, you can get the truly free plan that you don’t even have to provide credit card or any other payment info. You can then decide to move to a different plan if you think Ringplus is stable. How to get free mobile phone plans today with Ringplus using its BYOD program is a pretty good and decent one for most users. I will surely stay with them for a foreseeable future. Are you on contract with other mobile phone providers? Are you tired of paying a high monthly price even for non-contract phone? Leave a message below on what provide you are with, if you have tried Ringplus and whether you like it or not.